We cordially invite anyone with an interest to join us for this beautiful practice, at Chagdud Gonpa Dechen Ling in Cottage Grove, Oregon, the first center established by Chagdud Rinpoche in North America. 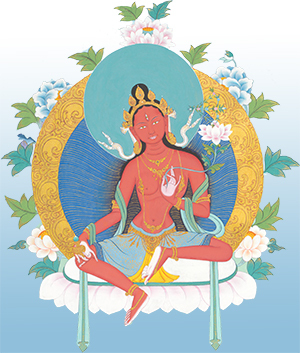 Jigme Rinpoche will be offering the Red Tara empowerment on Saturday December 1st at 9am, but it is fine to arrive on Friday afternoon even if you do not have the empowerment yet. To register, call Sharon Kness on 541-942-5258. Costs: $50 for Friday afternoon, $100 each day for Saturday and Sunday, meals included. Work study available. Offerings of food, beverages, flowers and funds for tsog are welcome.